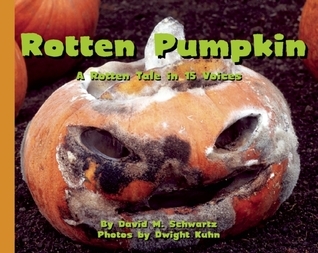 SUMMARY: Told in 15 voices--animals and insects that feed on the pumpkin, the molds that grow on it, and the pumpkin itself--this picture book tells the story of what happens to a Jack-O-Lantern after Halloween is over. Includes full-color photos. REVIEW: A couple of years ago, we had a pumpkin carving/decorating contest at my school. Students and faculty participated, and our eighth grade math classes drew on and decorated Halloween pumpkins to experiment with geometry and measurement. The finished pumpkins are on display in the library, and there were about 60 pumpkins, both carved and uncarved, in the library when all was said and done. Some students brought their pumpkins in a week or more before the deadline. After the "voting day," we had the pumpkins in the library until the students come pick them up. I gave them maybe a week to pick them up before I gave them away to one of our science teachers, who was excited to get them for just this reason. This book would be PERFECT to share with students while we have the pumpkins in the library. The carved ones always grow fuzzy, white and green mold inside--sometimes quite a bit of it if they were brought in early and never picked up. The kids loved looking at the moldy ones! In my middle school library, I am more likely to use this book for the photos than for the text. The "15 voices" format works better for some pictures than others. Some are more informative (the penicillin, slime mold, earmuffs, the fly), and others just didn't really make sense (the mouse, the squirrel). Personally, I would tell the students the text rather than actually read it aloud. Still, a great choice for science classes! Includes a small glossary and "Classroom Investigations" section, which briefly describes three simple experiments for further exploration at home or in the classroom. THE BOTTOM LINE: A gorgeous, colorful picture book perfect for elementary or middle school science classes, especially post-Halloween. The photos are absolutely beautiful! STATUS IN MY LIBRARY: It's not out until August 2013, but we'll be getting it! So glad to hear it worked out, Carol! I just checked out your blog--what a great resource! I am going to share it on my blogroll.